Mark Stoops and staff have put together Kentucky Football’s most impressive group of prospects in this 2017 recruiting class. According to 247 Sports, Kentucky Football has signed a class that is ranked 29th in the entire country. The talent pool this winter has found its way to Lexington which is led by four 4-star recruits. Kentucky has been rebuilding over the previous 4 summers. Stoops and company, led by recruiting coordinator Vince Marrow, have set a standard for Kentucky Football. Coaches of the program have built multiple relationships in many different states, leading to recruiting wins in multiple situations. Lets take a look at some of the recruits that have already enrolled to prepare Kentucky for another Bowl run. There is plenty of excitement surrounding this class. 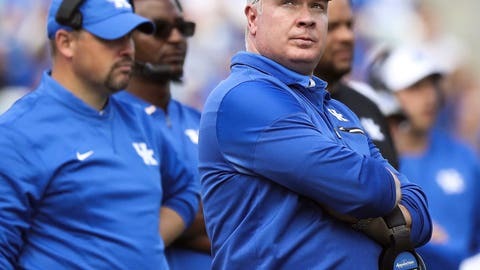 Kentucky football, at the moment, is building a head of steam with the notable returning starters that look to build upon last season’s run at the SEC East title. Keep an eye on some of these names, as they will make their names known when Spring Practice Rolls around. A number of student-athletes have chosen to take the leap and enroll early while leaving their high school classmates and friends behind. Kentucky has had seven players in this signing class that have chosen to forgo the rest of their senior year of high school to get a head start on college football. This is a trend that many athlete are doing to get a leg up on the playbook and get acquainted with the demands of being a college student. The Akron, Ohio native was once committed to Ohio State to play for coach Urban Meyer. Clark reconsidered his decision and chose to take his talents down south to Lexington in hopes to ignite the quarterback competition barring a redshirt season. Clark’s commitment settled the dust as Stoops lost a high profile quarterback prospect in Mac Jones who flipped his commitment to SEC foe, Alabama. The 6’4” pocket passer is ranked as the 17th overall Pro Style quarterback in the class. The lone running back recruit in the 2017 class for the Cats reigns from Springfield Ohio. At 5’11”, Koback enters the Spring as a possible red shirt option. Talent has found its way into the Kentucky backfield. The likes of Benny Snell, AJ Rose and Sihiem King have taken over one of the best rushing offenses in the SEC. Koback chose the Wildcats over Cincinnati, Virginia and Indiana. Thomas is a 3-star Wide Receiver from Pembroke Pines, Florida. The reciever looks to find the field early as an early enrollee in a talented pool of receivers. Thomas picked a home in Lexington after receiving scholarship offers from the likes of Florida, Louisville, and Michigan. Kentucky likes to recruit big defensive backs. Nothing has changed since the signing of starters Chris Westry and Derrick Baity. Johnson comes from Garden City Community College. The 6’3” defensive back looks to add to the depth of one of Kentucky’s best position groups. As a junior college transfer, Johnson has some experience at the collegiate level and turned down offers from Georgia, and West Virginia. Davis is a 6’2” inside linebacker that chose Kentucky over Georgia Tech, Louisville, and Purdue. The 3-star recruit looks to add to the poor depth at linebacker behind starter Courtney Love and returning sophomore Kash Daniel. Look for Davis to make an impact of special teams early on in his career. The Lexington Kentucky native landed on the first team all-state list. Wood is a dual threat quarterback and one of the top recruits from the state of Kentucky. As a quarterback, Wood put up video game numbers in the competitive 6A class of Kentucky high school football and played in the 2016 State Championship alongside Alabama Signee and 5-star prospect Jedrick Wills. Stoops has promised Wood a shot at the quarterback competition in Lexington. Look for Wood to make the move to slot receiver with the likes of Charles Walker. Cedrick Dort is another defensive back commit that Kentucky looks to add to the depth of the defense. The West Palm Beach (FL) native chose Kentucky over Wisconsin, South Florida, and Minnesota. Dort is six feet tall and continues with Stoops vision of big bodies on the boundaries. Kentucky Football has entered the realm of big time recruiting. Any fan can see that Stoops and Marrow along with other coaches, have done their work to put together a great recruiting class. Now it’s time to develop the young talent and utilize the young athletes that have chosen to rebuilt Kentucky Football. The 2017 season will be the tell tale when it comes to measuring success for this program. If this team can repeat the success of last season and add to the win total, essentially, fans can rest assured that the rebuild will ultimately become the reload.